This challenge is for two challenges. It's been awhile since I've done any challenges and miss the meaning and purpose they give me. Thank you to all the consultants that take their time to put these together and go over the entries. Time is time and nobody has a lot of it. So, again, thank you!!! FYI-Item #4 is the Bashful glitter paper. That is our Color of the Year. Our year starts September 1st so this gorgeous color will be replaced by a different color of the year. The ink, cardstock and glitter paper will disappear as the end of the year approaches. One thing I don't appreciate until I do a challenge and document all the items I use to do what I think is fairly simple is that I have everything at my fingertips from accumulating items over a period of time (10 years as a consultant and more as a scrapper). I love that and I can do everything I want or need to do and never have to run out to the store that wastes so much time. WooHoo! 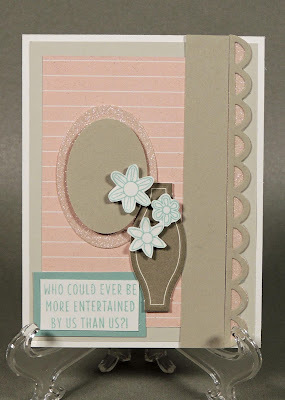 Love your interpretation of the sketch challenge and how you distributed Color Dares color palette, and the scalloped border is a nice finishing touch. Thanks for sharing with us at Color Dare this week. Very pretty card! I love all your details and how you used the Color Dare colors. Thanks for sharing with us at Color My Heart. Thanks for the inspiration, Michelle. Very pretty card. I love the little touches of glitter paper. Thanks for playing along with us at the Color My Heart Color Dare. One of my favorite sayings! Lovely card. Thanks for playing at Color Dare.